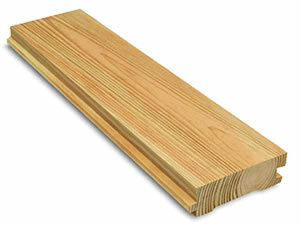 YellaWood® T&G Pressure Treated Porch Flooring is KDAT (Kiln Dried After Treatment)! That's very significant, as KDAT provides many advantages over regular pressure treated Porch Boards. KDAT explained, including list of advantages. We sell YellaWood® KDAT SuperSelect Premium Grade with Lifetime Limited Warranty. If you prefer KDAT YellaWood® Balusters and Railings, we have those too! Of course, any of our other exterior Balusters and Railings can also be used with YellaWood® Porch Flooring. Additionally, we have YellaWood® Deck Boards, but they are not Tongue & Groove. Purchase by the foot or as a 3" Sample. Lengths shorter than 8' are not returnable unless defective. Overall length may be 1/4" shorter than what's listed but will be consistent for each shipment. KDAT Porch Flooring should be primed on all 6 sides after cutting to size but prior to installation. See YellaWood® Porch Flooring - Storing, Painting, and Installation. Shipping Info: Select one:--------------- This item is 58’’ or longer. I read the 'Important Shipping Info' link above.- This item is less than 58’’ in length.